Dealing with this part of recovery has been one of the most challenging for me. When I let it, I can feel a lot of shame for how I’ve neglected my health and how it’s affected my teeth. So, confronting this “monster” head on has been important for me in growth forward. This was my third time in his office. I felt overwhelmed with encouragement and support the first two times. I can tell that him and his staff, including my hygienist Alejandra, really do see their patients as human beings in process who have a unique story. From the get go, they desired to know my story and to be used in some way in making it a little bit better. That is such an essence of how we’re made – to connect with the story of others and make it better. 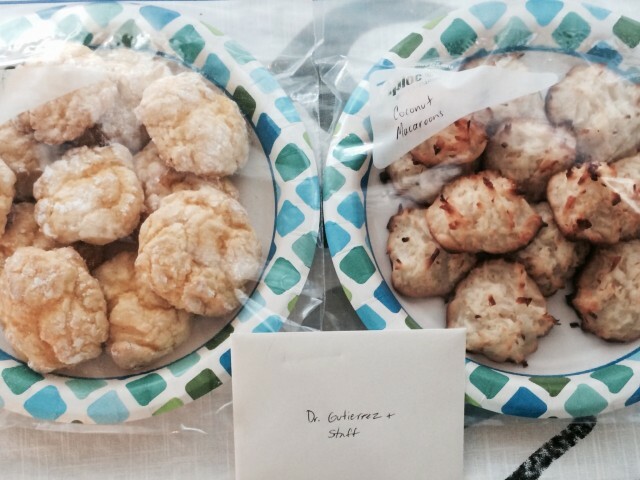 I feel like there is not enough I can do to thank them for their support, but yesterday I made them some coconut macaroons and lemon crinkle cookies with a note of appreciation to say thanks. I was extremely nervous to give Dr. Gutierrez and his staff this note and baked goods. It was so awkward to walk into the office and say “Here ya go,” but I wanted to be bold. I wanted to not let fear get the best of me. I don’t want to give fear another chance to rule my life. So what happened? I was reminded how we are all human (even those professionals and people you interact with – your doctor, your dentist, the attendant at the ARCO station) and we desire to connect and participate in the stories of others. I was surprised by what my plates of baked goods and card meant to Dr. Gutierrez and his staff, but then I was reminded of that truth. 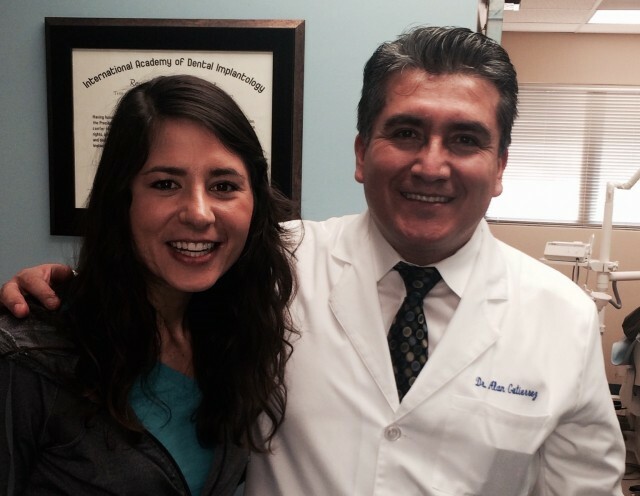 Dr. Gutierrez and his staff are an important part of my story. They have given me so much practical and tangible encouragement and have been beyond generous in helping me financially make my dental work possible. If you’re looking for a dentist in the Whittier Area, check them out! We seem to feel the need to paint a picture of our life being all put together. We want everyone to know that “we’re good” or “we’re okay.” Authenticity I think means being truthful, unmasked. For me that has mean owning when things are not going well – whether that be in recovery or any other area. But it also means allowing others to celebrate with me in success. When we brush past or dismiss what is really going on, we accept an artificial form of love. People are loving us for their idea of us, rather than for who we are – the good, the bad, and the ugly. Want to know how much people care about you and how much God loves you? Be authentic and you will see. People’s reactions – their outpouring of compassion and love – when I share my struggles and/or my story of recovery from Bulimia have been nothing but supportive. When I hide what’s going on I feel isolated, alone, and discouraged. When I share what’s going on I feel loved, encouraged, and empowered. The choice is ours. The choice is yours. Listen to that quiet whisper in your life (whether or not you call it the Holy Spirit or not is your choice). Do what makes you feel uncomfortable. Remember that life begins outside of your comfort zone. Growth will never happen if you don’t step out there and take risks. This process has shown me that even though I don’t know a lot of the end results, it is a lot easier for God to work with a person that is moving…taking risks. It’s those little actions that cultivate an attitude of openness and trust. Be prayerful, be expectant that God will speak to you and speak to those around you. He is on the move. He desires to change your life and others. When you’re expectant of that, you begin to see how He’s doing that all around you. Your lenses that you see things change and you find hope. Read about my journey to recovery from bulimia.